Regular maintenance is the best way to take care of any mechanical system, especially one as large as the wall of a house. Your garage door works under a lot of stress, due to the high tension and heavy weight involved in its operation. This makes some amount of wear and tear inevitable, which means that you'll need a professional to regularly check the system and apply a few adjustments and fixes to keep things smooth and operational. That's what we can offer you. These components are the ones who help your door move, and therefore they must be able to both support its weight and have the strength to actually lift it. Needless to say, that means they play a role that's downright crucial. Our team will inspect their coils for deformations and lubricate them as necessary. If your door seems to be getting unbalanced, we'll perform the required spring adjustment to make sure that the tension is completely even. These photoelectric eyes are what your opener relies on to detect when there's something blocking the door's way. Misaligned sensors can lead to a serious accident, or to a scenario where the door keeps reversing for no obvious reason. Our technicians will check the sensor alignment and reposition them if that's required. We'll also make sure that their lenses aren't scratched and that nothing is blocking their "vision". As for the rest of your overhead door system, we'll carefully examine all of its hardware parts to make sure there are no hidden issues. We'll check the vertical and horizontal track alignment as well as whether or not these components have developed any bending or rust. We'll inspect the rollers as well, and lubricate them to keep their performance smooth and efficient. The cables and the hinges will receive a similar treatment, and, last but not least, we'll check the door panels, patch up and fix any minor cracks or dents and make sure rust hasn't begun to claim any section. 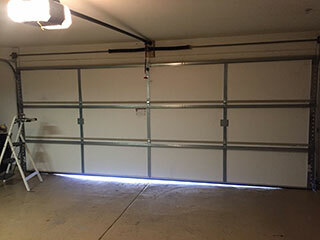 If you really want to make the full use of your garage door and to be able to keep using it for as long a time as possible, then our experts at Garage Door Repair Oceanside are here to help you out. Contact us today to schedule an appointment.